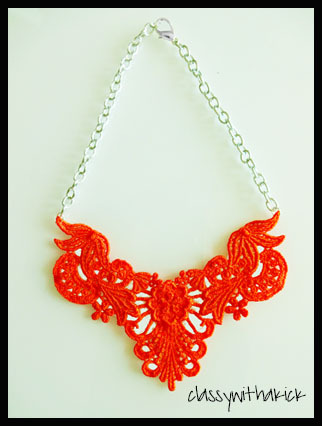 Ok so I usually do a Faves and FOFFs post on Friday but since I just released my newest Lace Necklace color yesterday...this SVS post takes precedence! Over the weekend, I dyed up a batch of super cute bright orange lace per the requests of quite a few potential buyers through my Etsy store and CWAK blog readers. My first thought?? OMG Twinsies! Ok, so more like fraternal twins but very similar. The best part is this...the PRICE DIFFERENCE! Ok, you can buy the J. Crew version for $150 (for string and gold chain) or you can buy my pretty little lace version for $20 (gold chain is now available, BTW). Hmm...tough decision right? I think not! If you end up making the RIGHT decision and buy the lace version, you can save even more with free shipping using this code: TWINSIES. Hope you all have a great weekend! Oh and I'm in NY next week so blogging will be spotty. I apologize in advance! Your version is SO much more affordable than the JCrew one and just as cute! 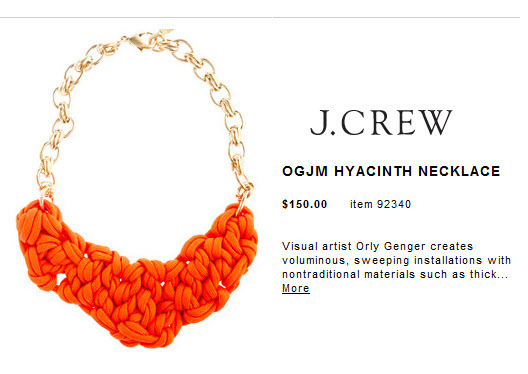 Who would spend $150 on a necklace?! Have a great weekend, Jill! Love your necklaces! Have a great weekend! I like yours better than the J.Crew one! And orange is one of my favorite colors! I need to scape up some $$! Thanks Niki! :) If you do, make sure you use the promo code for free shipping! This is GORGEOUS, Jill! :) I love it! 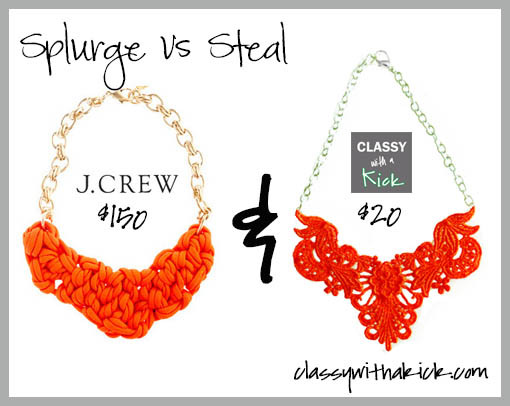 Love both necklaces! Thanks so much for your comments on my blog! but I also sell them too on Etsy! Thanks for you comment...I will check out your blog as well! Totally a steal, love it!